Where has all that elegance gone ? With every passing day our political discourse is losing its elegance. Tweets that specialise as much in slag as in below-the-belt digs have become the norm. Parliament is no longer witnessing the bonhomie it is known for. So is the Central Hall of Parliament, the Mecca of political gossip over cups of tea and coffee. Frankly, the political etiquette was different till Rahul Gandhi and Arvind Kejriwal appeared on the national scene, and found a common target in Narendra Modi, who had cut his teeth in the RSS and Gujarat politics. And said good-bye to the age old practice of leaders not allowing their political animosities to come in the way of normal courtesies. Modi - mann ki baat Neither Indira Gandhi nor her son Rajiv Gandhi was guilty of practising 'touch me' not politics. Neither Narasimha Rao nor Atal Behari Vajpayee, whose sense of humour is legendry. Marxist Chanakya Harkishan Singh Surjeet had friends across the spectrum, and they valued his advice, which is often unsolicited, as also his insights. Well-read Hindutva Charioteer, Lal Krishna Advani is a class apart and has been a delight to meet for the journos, young and old contemporaries alike. India is a country, where politicians begin their innings as lawmakers by speaking half-truth (over election expenses). Indian politics is an arena of hypocricy as well, and hence the time tested "Ï have been misquoted,"alibi. So much so, any leader, for whom awaits a long innings,must avoid short cuts to catching public attention. And ignore the Arvind route to ignominy the hard way. unadulterated quest for power. Well, you cannot blame Rahul and Arvind for demanding answers from Modi for every folly of the government. What can they or any one for that matter do, if NaMo does not answer their barbs, goes into selective silence and delivers one-way "mann ki bat" on air ? Blaming the Prime Minister for something the Election Commission does and which is not to their liking highlights bankruptcy of politicians. During the recent Gujarat election, the Chief Election Commissioner was called names by Rahul Gandhi and spokespersons in the Congress. Arvind Kejriwal and his ilk just did the same when 20 AAP MLA were declared disqualified for holding 'offices of profit'. "It is politics, stupid", you may say treating me as the ignoramus of the First Order. But "Elementary, My dear Watson", Sherlock Homes would have said going into a long monologue. It is difficult to believe that Congress and AAP leaders are not aware of the basics – that EC is a three-member body and all the decisions are taken by consensus. So much so, how can the CEC be blamed and accused of "acting like a Gujarat cadre IAS officer", and "paying obeisance to Modi". This is exactly what Kejriwal, who was a bureaucrat, before he made his sartorial change through the Anna Movement, did. The talk show anchors have refused to listen to a former CEC T S Krishna Murthy, who tried to educate them on the working of the poll body and EVMs. To the delight of backroom Congress leaders guiding Rahul Gandhi! May be. Ignorance is not a bliss in public domain. Certainly, not the trait of appearing as dumb and deaf! 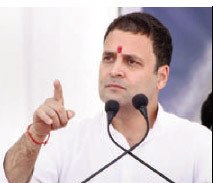 Rahul Gandhi Talking tongue-in-cheek rhetorically, like for instance, "Why did Modiji 'sell out' Gujarat's education system,"or "What have you done for Dalits in Gujarat," may be a political expediency to earn brownie points. It will not yield votes. India is a country, where politicians begin their innings as lawmakers by speaking halftruth (over election expenses). Indian politics is an arena of hypocricy as well, and hence the time tested "Ï have been misquoted,"alibi. So much so, any leader, for whom awaits a long innings,must avoid shortcuts to catching public attention. And ignore the Arvind route to ignominy the hard way. 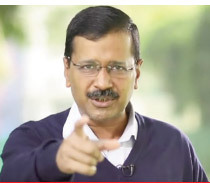 Arvind Kejriwal President of the Indian National Congress blaming the Prime Minister of India for demonetisation and consequent job loss is a legitimate political right. As the leader of the main Opposition party in the country, he can haul the government on the coals for "compromising with national security and strategic interests" and accuse that the government was "caught snoozing" when China was "occupying the Doklam plateau with fresh military installations". But asking Modi why he is not talking in "mann ki bat" on these issues is neither here nor there. It is a new low in a manner of speaking after the series of questions Rahul and Arvind had shot at Modi and demanded instant answers. Both, indeed many more, whose ranks are swelling, like them, (including this writer) may not like Modi and his style that appears to subscribe to the view that he is the only man, who matters, in the cabinet. This section, like Yashwant Sinha does every day, may like to see Modi's back soon. Yet it doesn't give them nor any one with the same mind-set to transport India into Presidential form of government. During her heydays, Indira Gandhi had toyed with the idea of such a switch over but gave it up on wise counsel. Let us not presume Modi is India's Trump though he may like to embrace the US President as often as the opportunity arises. The dig at Modi on what Rahul Gandhi and his spokesman see as "Hugplomacy" is in bad taste. As Valson Thampu (former principal of St Stephen's College, Delhi) remarks, "no hugs for Congress for making fun of Modi on social media". Agreed, Modi has made 'hug' his trade mark diplomacy. And a new protocol norm. The Congress will do well to heed Valson Thampu's advice: "Any action or gesture can be isolated from its context and sarcastically tweaked and made to look riproariously ridiculous. Thinking people know that this reflects not the clumsiness of the intended targets, but the crudity of their calumniators. If the Congress wants to win back the hearts of its erstwhile votaries, this is precisely what it should not do". One may add that diversification into trolls and emulation of social media practice of going viral with what amount to no more than abuses and third class jokes offer no electoral nirvana. Either now or tomorrow. Whether Modi hug diplomacy has won respect for India as the Bhakts assert is a moot point. TV screens have showed how several world leaders felt awkward by the Indian leader's gesture. That is no reason for Rahul to rush with the tweet: "Narendrabhai, baat nahi bani (claims did not materialise). Terror mastermind is free. President Trump just delinked Pakistan military funding from LeT. Hugplomacy fail. More hugs urgently needed." And "With Israeli PM Benjamin Netanyahu visiting India, we look forward to more hugs from PM Modi! #Hugplomacy". 'Gabbar Singh Tax', 'Fake in India', 'Gross Divisive Politics', are good tweets for idle thought on Prime Minister Narendra Modi's political style. Cut in the same mode: "UPA's Aadhaar = A voluntary instrument to empower citizens. NDA's Aadhaar = A compulsory weapon to disempower citizens." A day after the 2017 Christmas, a Congress leader took aim at Modi as Bad Santa. "All over the world at this time an old man with a white beard creeps in your house through chimney and puts money in your socks. (but) In India an old man with a white beard crept into your house through TV removed money from your pockets, cupboards, lockers & left you only in your socks." Hardik Patel, a young Patel, was more explicit in his critique of Modi. "Dekho, dekho kaun aaya, Modi tera baap aaya (See who's come, Modi, it's your dad)". A nutty for a 24 year old, as a headline said. But he was the person on whom the Congress had pinned its hopes of revival in Gujarat. He did not deliver and left egg on Congress face with his "deeply casteist, and rabble-rousing" tongue. Congress will do well, therefore, to heed Valson Thampu's advice: "Any action or gesture can be isolated from its context and sarcastically tweaked and made to look riproariously ridiculous. Thinking people know that this reflects not the clumsiness of the intended targets, but the crudity of their calumniators. If the Congress wants to win back the hearts of its erstwhile votaries, this is precisely what it should not do". One may add that diversification into trolls and emulation of social media practice of going viral with what amount to no more than abusesand third class jokesoffer no electoral nirvana. Either now or tomorrow. Politics is a nuts and bolts game, of working systematically from the booth level and nurturing leaders. Prashant Kishors can do no wonders unless a party has its cadres battle ready.The short point is : it is time to restore civility in public discourse by returning to basics. Much has been said about Mani Shankar Ayer's "neech aadmi" barb at Modi. Frankly, he cannot claim copyright on the expression. It was heard in Lyuten's Delhi several times while on the background of Modi. No one went public like the former diplomat did.The clever Gujarati that he is, Modi exploited the snide aside to his advantage just as he did with Ayer's Chaiwala take in the 2014 election. Bhishma Narain Singh In all honesty, the award for public discourse stooping low should go to Narendra Modi and his Sancho Panza. Both have been targeting Rahul from day one of their joint campaign for a Congress Mukt Bharat. For them he is Sahibzade. He can do no right. They have made it their mission to lampoon him. This is not good politics either. Nor is it true to long forgotten Shyam Prasad Mukherjee school, Deen Dayal legacy and Vajpayee- Advani practices. If Rahul has been making half-truths appear as full blown truths, the Modi-Amit Shah combine is not lagging behind in their penchant to tear into the Congress. A case in point was the way they had built the Gujarat poll plank over a dinner meeting Mani Shankar Ayer had hosted at his home with a former Pak foreign minister in attendance. The way Modi had latched on to tweets by a Kashmiri Congressman, Salman Nizami,allegedly questioning his parentage was an absurdity not expected of a person who is also the Prime Minister of 123 crore people.Modi may be right when he charges the Congress with "abusinghim out of desperation". But should he hit the same button? And should his party spokesman dub Rahul as a "Babar Bhakt" and a "Kin of Khilji". From "Love Jihad" to controversial Hindi film "Padmavat" any and every issue has become a good missile to Parivar's fringe elements; they have managed to become the mainstream in the Modi raj; literally they have hijacked the public discourse at the district and state level. As veteran Parliamentarian Bhishma Narain Singh told me once, Indira Gandhi regularly met the Opposition leaders and hosted them lunch and dinners even when she had comfortable majority in Parliament. She never stood in the way of interaction with the Opposition as the Parliamentary Affairs Minister. 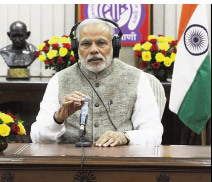 Unlike Modi today, Rajiv Gandhi, V P Singh, I K Gujral and Atal Behari Vajpayee kept the channels of communication with the Opposition during their day. Rajesh Pilot, as a minister, had seldom any trouble in pushing through his bills. 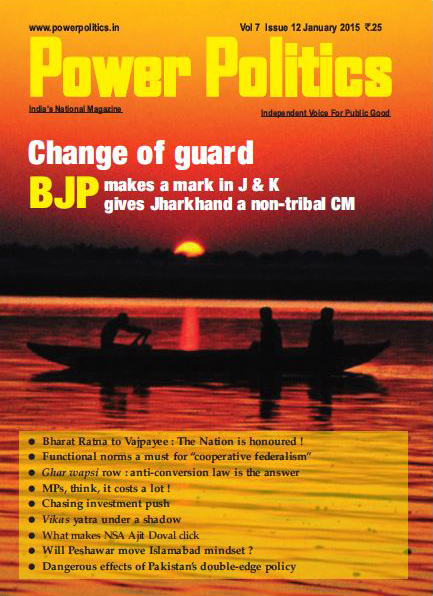 "Not rules but mutual trust and respect are essential for running Parliament," says Bhishma Narain Singh. A return to parliamentary basics and parliamentary etiquette is a badly needed booster shot for Indian democracy. caste and community leaders speak the 'fringe' language and indulge in action unbecoming of them. Result: the nation is witness today to a person who heads the BJP in a state say that fingers raised at Narendra Modi will be cut off.Undeniably, these fulminations have replaced politics of hope by the politics of fear. Secularism and fascism debate used to hold every one's attention in the past; everyone loved to wear their credentials on their shirt sleeves. Yet, the debate never degenerated into a slanging match, and ideological differences never translated into personal enmities. Not any longer. Fiery speeches on the floor of Parliament never used to come in the way of leaders exchanging pleasantries as long last friends. Even at the height of Bofors debate in Parliament, where the entire Opposition bayed for the blood of the Congress leadership. 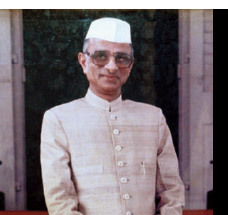 In the nineties, Kamal Morarka, from the front benches of the Opposition in the Rajya Sabha, made a blistering attack on the government while asking a supplementary question. It was Prime Minister's day. Narasimha Rao listened to him with rapt attention. As the question hour ended, Rao signalled Morarka and he crossed over to the PM's seat. Both were seen locked in a huddle for a long while. Sushma Swaraj, as external affairs minister, faced much flak in the Lok Sabha one day two years ago. In the lunch break she met Rahul Gandhi in the Central Hall. When the House met, Rahul took the floor and said: In the lunch break, Madam Sushmaji met me. Held my hand. And asked me, 'beta, why are you angry with me?' I told her I am not angry with her……." Listening to the three-time MP, one felt sad at the enormity of the fall in debates. What a far cry this is from the days when Rajiv Gandhi sent Vajpayee to UN General Assembly after he heard that the BJP leader needed some urgent treatment abroad. Also few know of Rajiv's gesture of delaying the fall of Congress supported Chandrasekhar government just to enable Advani to attend to a marriage in his extended family with no political distractions. The author is a senior journalist. He has been the Chief of the Bureau in India's famous liberal newspaper 'National Herald,' New Delhi.